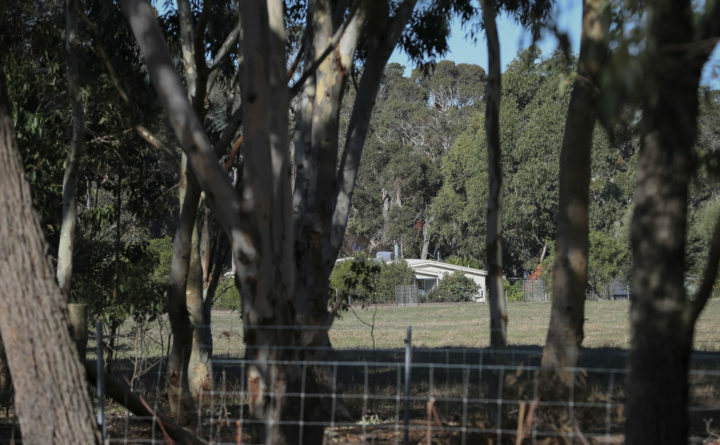 A property is seen from a police roadblock where police are investigating the death of seven people in a suspected murder-suicide in Osmington, east of Margaret River, 162 miles (260 kms.) south west of Perth, Friday, May 11, 2018. An Australian community is reeling from the deadliest mass shooting the country has seen in more than 20 years, after seven people, including four children, were discovered dead on a rural property near Margaret River. Authorities in Western Australia responded early Friday morning to a home in Osmington, not far from Perth, where the four children and three adults were found dead from gunshot wounds, according to local news reports. The mass shooting has rattled Australia, where lawmakers passed some of the world’s most restrictive gun-control laws after a 1996 massacre in Tasmania. Western Australia police commissioner Chris Dawson said at a news conference that officers responded to the scene about 5:15 a.m. and discovered the seven bodies; two adults were outside, and five other victims were inside the home in Osmington, a small town nestled in Western Australia’s South West. Police said two firearms were also found at the scene. “This devastating tragedy will no doubt have a lasting impact on the families concerned, the whole community and, in particular, the local communities in our South West,” he told reporters. Authorities have not publicly identified the deceased, but a family friend told the Australian Broadcasting Corp. that the seven victims were Peter and Cynda Miles, their daughter, Katrina, and Katrina’s four children. “It’s just horrifying, just horrifying,” Haynes, a family friend, told 9 News Australia, explaining that she heard three gunshots – and then two more – at about 4 a.m., but did not think much about it. “They were good people. It’s not fair. It’s not fair,” she said. The deadly incident was Australia’s worst mass shooting since the Port Arthur massacre in 1996, when a gunman opened fire in a cafe in Tasmania and then hunted down more victims in his vehicle, killing 35 and injuring many others. As The Washington Post reported, soon after the 1996 incident, John Howard, who was elected as Australia’s prime minister that year, enacted strict gun control legislation. Known as the 1996 National Firearms Agreement (NFA), the law banned the possession, manufacture and sale of all semiautomatic firearms and pump-action shotguns other than in “exceptional circumstances,” such as military and police use. The NFA also mandated that applicants wait 28 days from the time they obtain a permit to the time they buy a weapon. Applicants are also required to undergo firearms training, and weapons and ammunition must be stored separately, according to the law. The Post’s Kevin Sullivan reported that the 1996 massacre had united Australians on the gun debate. In 2016, 20 years after the shooting in Tasmania, The Post’s Christopher Ingraham cited research published in the Journal of the American Medical Association showing that Australia had not had a mass shooting since the reform, and that suicide rates in the country had been on the decline. He noted, however, that there were no significant changes in gun-related homicides in the country. But a 2016 investigation by an Australian newspaper, the Age, found that gun-related crimes in Melbourne had doubled over the previous five years. Haynes, the family friend, told the ABC that the victims had moved into the home about three years ago. Neighbors reported that the children were home-schooled there. Haynes told 9 News that over the years, Cynda Miles had become a beloved member of the small community.